I watched the version from the 40’s as Chaplin called this his “definitive version” but I can’t help but feel it was just because he thought it was more in line with the current obsession with talkies rather than actually benefiting the film. I couldn’t help but find his narration excessive in place of what I would assume would be title cards and that it rarely added anything. 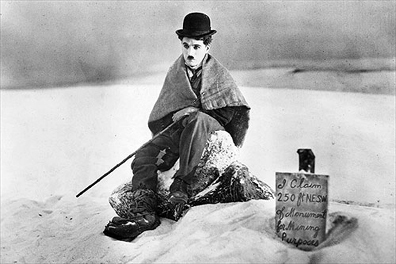 That said, everything else in the film is classic Chaplin which is a fantastic thing. His proclivities for making the absurd enveloped in both melancholy and optimism as he depicts his down on his luck Tramp. He shuffles (quite literally as well) from set piece to set piece, dealing with such comically ludicrous aspects of cannibalism, using a dog leash for a belt (with the dog on it), and the infamous house on a ledge. With Chaplin I think everything just works. What’s meant to be funny is funny. What’s heartwarming is heartwarming. He is one of my favorite directors and while I don’t think this reached the heights of his other three features I’ve seen (Modern Times, Great Dictator, City Lights), it certainly doesn’t drop any balls. I fully expect to like the 20’s version even more.